Season the veal loin with salt and gingerbread spice mix, then cook sous vide in a bag at 53°C for four hours. Cool quickly. Brown in brown butter until golden just before serving, bringing the core temperature back up to 53°C. Mix the cream and parmesan together and warm over a low heat, pour into two silicone half-sphere moulds and freeze. Cook the polenta in the milk over a low heat for 20 to 25 minutes. Pour some into canelé moulds, add a ball of frozen cream, cover with the rest of the polenta, leave to cool and turn out of the mould. Cut the loin into small cubes. 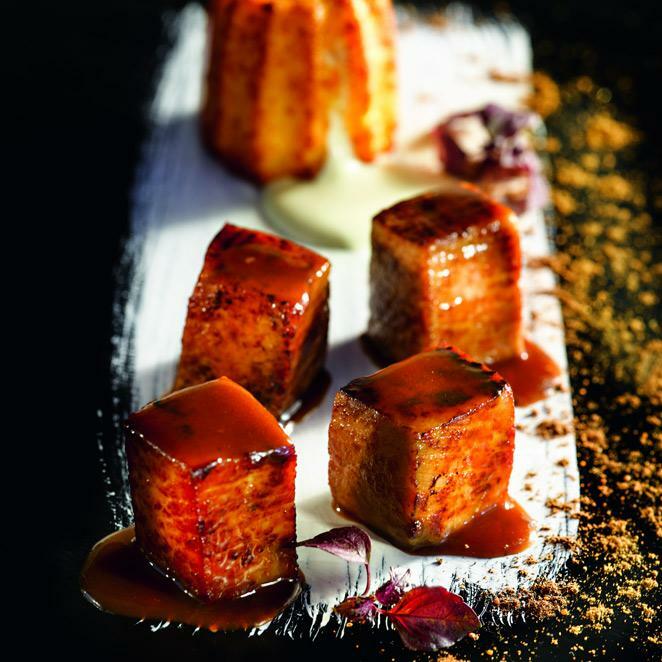 Serve with the veal sauce, seasoned with gingerbread spices and whisked with butter, and then the canelés having placed them in the deep fryer for four minutes just before serving. You can also marinate the loin in the same seasoning the day before and place it on a dish in the refrigerator. Cook in a conventional oven at 100°C with a probe until the temperature at the centre reaches 53°C. © Copyright 2018 – So France. All rights reserved.